We are committed to providing all our students with the accommodation that is best suited to their needs. If you have an impairment or disability we are here to help you find the room that is right for you. On this page you will find details of the range of residences we have with adaptations available, and we can advise you with making your application. We also recommend that you visit a residence or department to carry out your own access audit. Please contact us for further information about a residence or to book an appointment to visit. We have rooms available with adaptations for hearing impaired undergraduate students in Badock Hall, Clifton Hill House, Durdham Hall and Goldney Hall.The exact adaptations in each residence are variable and we recommend you contact us if you would like advice on the specific adaptations in any residence. When making your accommodation preferences on the application form, you should select from these residences and tell us about your requirements in the relevant section of the application. There is the capacity to make rooms in several of our residences suitable for a student with a visual impairment, depending on your individual needs, and we recommend you contact us before making your application to discuss your requirements. We have rooms that are suitable for students with restricted mobility in our undergraduate residences at Badock Hall, Durdham Hall, Hiatt Baker (self catered), Richmond Terrace and Campus Houses, and in our postgraduate residences Deans Court and Woodland Court. The adaptations in each residence are variable, as is the suitability in terms of location and we recommend you contact us if you would like advice on the specific adaptations in any residence or to discuss which option might best suit your particular requirements. 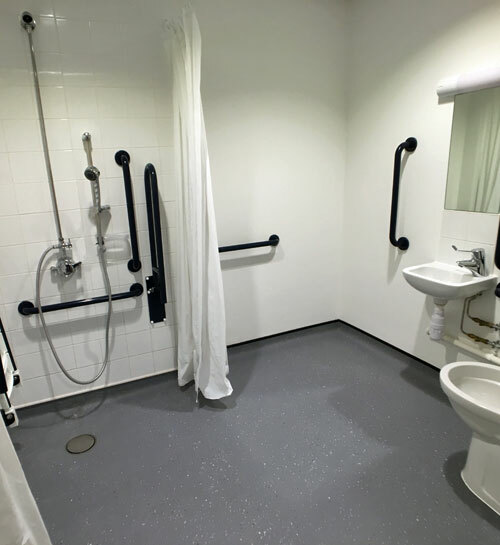 Hiatt Baker self catered has four accessible en suite rooms which have been fully adapted for a wheelchair users and/ or students with mobility needs within 9 bed cluster flats. Adaptations include lifts, power assisted doors, the installation of low level kitchen work surfaces and storage in the shared kitchen, accessible storage in the bedroom area, an accessible wetroom including shower chair, hand rails and emergency call pull cord. Students living at Hiatt Baker self catered have the option to pay for a catered package allowing them to take meals in the dining hall at Hiatt Baker if desired. Power assisted doors have been fitted throughout the main building of Hiatt Baker as well as a wheelchair accessible lift allowing access to the onsite communal facilities and there are four disabled parking spaces available. Access to the University is via the student bus, which is suitable for wheelchair users - the bus hub is conveniently located adjacent to Hiatt Baker Hall. 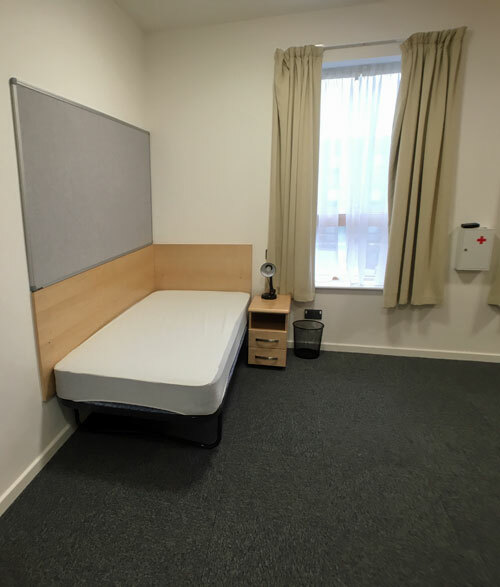 Durdham Hall has one accessible en suite room which has been adapted for a wheelchair user and / or student with mobility needs in a 5 bedroom cluster flat. Adaptations include power assisted doors, the installation of adjustable kitchen work surfaces and low level storage in the shared kitchen, and accessible storage in the bedroom area as well as an accessible wetroom including shower chair, hand rails and emergency call pull cord. There is also a small launderette room next to the bathroom. Students living at Durdham Hall have the option to pay for a catered package allowing them to take meals in a catered residence at Stoke Bishop if desired. Power assisted doors have been fitted throughout the main building of Durdham Hall allowing access to the onsite communal facilities. The location of the residence is such that it is most suitable for a wheelchair user who is bringing their own vehicle or who has an electric wheelchair capable of managing a steep incline. Alternatively access to the University is by the student bus which is down a significant incline (we suggest you test the routes for yourself before making a decision). There is a disabled parking space located in close proximity to the flat containing the accessible ensuite room at Durdham Hall. Badock Hall (one of our catered residences) has two accessible en suite rooms which have been adapted for a wheelchair user and/or student with mobility needs in a four-bedroom annexe of Badock Hall. As with all our catered residences, the kitchen facilities are limited, but the annexe does have a small pantry area suitable for preparing some meals with low level kitchen work surfaces including sink suitable for a wheelchair user. The rooms each include an accessible wetroom including shower chair, hand rails and emergency call pull cord. 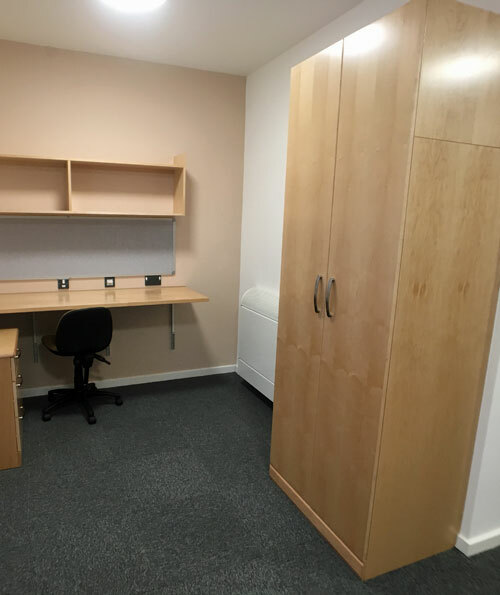 There is currently limited low level storage in the bedroom area and a desk which is not height adjustable but these items could be provided if required. There are no power assisted doors currently fitted in this residence apart from the door on the main building entrance. There is a disabled parking space available. The location of the residence is such that with the installation of a ramp on the external route to the bus hub it should be possible for a wheelchair user to access the bus hub although the individual should test the routes for themselves before making a decision. The University's Disability Services is a confidential service providing information, advice and guidance to prospective and current disabled students. Students who need their own transport due to a disability can apply for a residence parking permit. You will need to apply separately for a campus parking permit if required. Hiatt Baker wheelchair accessible room, bathroom.